Human gene editing, plus UFO sightings, smart manufacturing, autonomous vehicles, and much more. The first scientific papers about breakthrough developments in the use of the gene-editing tool CRISPR appeared just six years ago. Researchers soon recognized that this relatively accurate and easy-to-use technology makes possible a vast number of applications in plants and animals—including humans. CRISPR was back in the headlines in December 2018 at the Second International Summit on Human Genome Editing in Hong Kong. The highlight of the meeting was a presentation by the now-notorious Chinese scientist He Jiankui, in which he explained how he used CRISPR in engineering a human embryo that resulted in the live birth of twin girls. Although much uncertainty clouds our knowledge of what He actually did, his claim ignited a heated round of discussion. 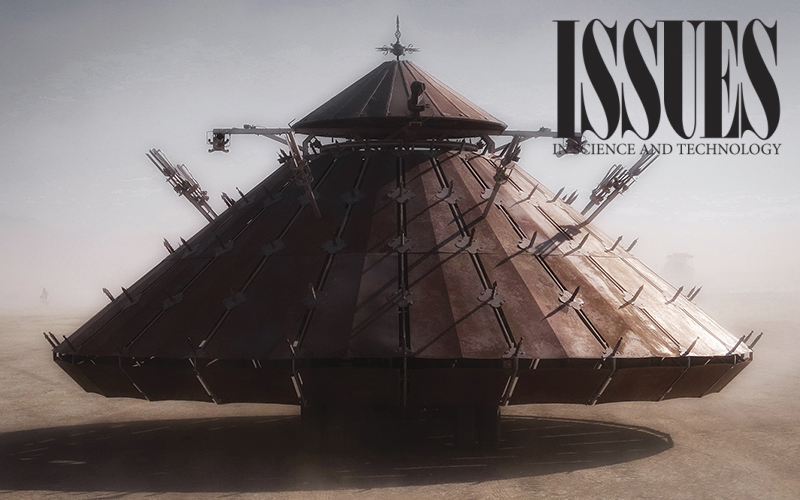 For the Spring 2019 edition of Issues, we invited a few of the leading thinkers in the field to comment on where we are in the process of understanding and managing this powerful technology. Henry T. Greely addresses the immediate practical problem of how to prevent rogue scientists from violating scientific and social norms. He recommends deterrence measures that will make miscreants pay a heavy price for their deeds and some norms and procedures for disclosure when people have suspicions of wrongdoing. Peter Mills encourages us to consider the professed purpose of any use of this technology as well as its implications in light of the principles of human rights. Francoise Baylis acknowledges the various frameworks that should be applied when approaching this question and places special emphasis on the necessity of achieving broad societal consensus before moving forward with this technology. Reaching that broad social consensus will necessitate engaging with all the world’s religious and ethical traditions. Mohammed Ghaly provides a valuable service in explaining how Islamic scholars and ethicists approach the question. 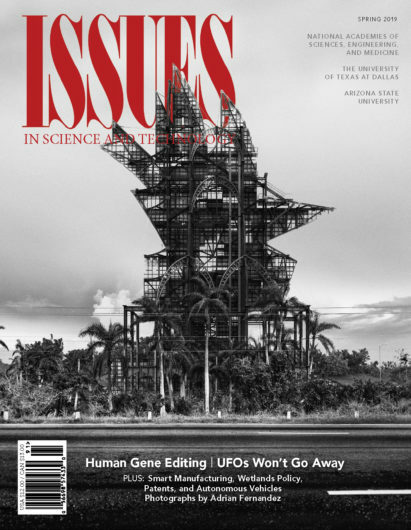 Also in this issue, Keith Kloor takes a look at seven decades of UFO stories, and investigates why extraterrestrial enthusiasts, the news media, and the Pentagon are all interested in promoting these tales of close encounters. The researchers Diane E. Bailey and Ingrid Erickson find that advocates for self-driving vehicles attempt to steer the discussion of improved safety away from alternative approaches. Smart manufacturing—the incorporation of digital technologies into factories—could offer huge economic rewards to the nation’s manufacturing sector if the United States takes the lead on information governance, argue Keith B. Belton, David B. Audretsch, John D. Graham, and John A. Rupp. According to Charles N. Herrick, American wetlands, under threat from Trump administration reform efforts, require a policy framework that can assure stewardship of these vital areas even in the face of challenging political winds. And Steven J. Miller finds that patenting may have little to do with innovativeness in today’s corporate environment. In the Philosopher’s Corner, J. Britt Holbrook examines new efforts to expand access to scholarly literature and democratize knowledge. In his Sciences, Publics, Politics column, Matthew Nisbet finds that the Democratic proposal for a Green New Deal hurts the party’s electoral prospects in 2020 and weakens efforts to build momentum on politically feasible climate and energy policies. In books, Taylor Stone illuminates how “the medium of modernity” has transformed the world in his review of Electric Light: An Architectural History by Sandy Isenstadt. Rebekah Simon explores the different patent systems that developed in the United States and Europe as described in Shobita Parthasarathy’s Patent Politics: Life Forms, Markets, and the Public Interest in the United States and Europe. Finally, Dragan Boscovic looks at blockchain, the confounding, potentially promising technology that everyone seems to be talking about, in his assessment of The Blockchain and the New Architecture of Trust by Kevin Werbach. These essays are accompanied by the remarkable photographs of Cuban artist Adrian Fernandez, which were inspired by the festival structures of Cuba’s Christmas celebrations, and images of the beguiling desert installation of Phillip K. Smith III.